TTK (Toyo Communication Equipment Company Ltd.) Model YT-506 Japan. 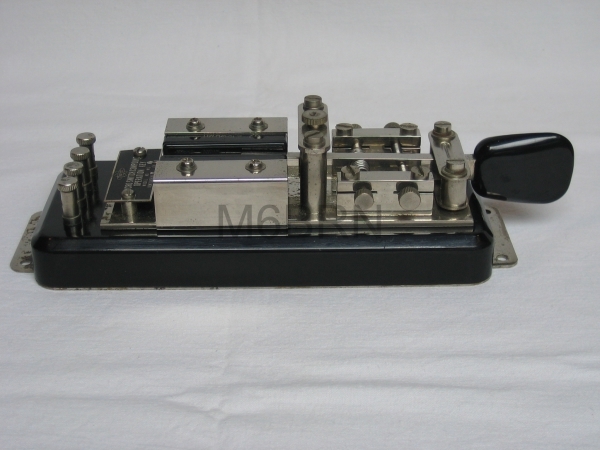 All plated key with doorknob style knob integrated into a black bakelite box which completely covers the key. It is mounted on a wooden base which carries a label in Japanese. The label shows the date as "Showa 18 years, 3 months". This is the 18th. year and the 3rd. month of the reign of the Showa Emperor. Showa was the formal regnant title of the Emperor we know as Hirohito which was his personal name. His reign lasted from December 25 1926 to January 7 1989 making this key being manufactured in March 1945. Japanese Straight Marine Hand Key Type 2 S/N 3192 circ March 1942. Maitsuru Navy Factory. 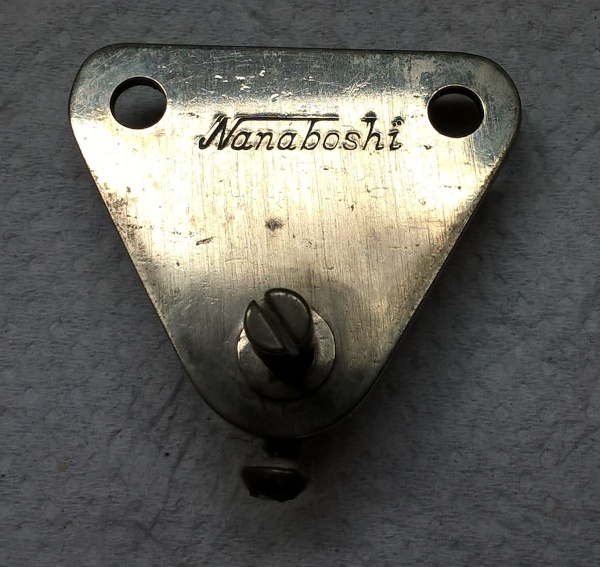 This Japanese straight key purchased in Saint Petersburg, Florida n the U.S. is identical in design to the Japan Radio Corporation Marine key model KY-3A but the label is from the Maitsuru Navy Factory where this and the examples below would have been manfactured. The label states that it is a Type 2 Marine key and shows the manufacture date as "Showa 15 years, 3 months". This is the 15th year and the 3rd. month of the reign of the Showa Emperor. Showa was the formal regnant title of the Emperor we know as Hirohito which was his personal name. His reign lasted from December 25 1926 to January 7 1989 making this key being manufactured in March 1942.
? ? Sea ? Span ? This Japanese straight key was purchased from Noblesville, Indiana in the U.S. from an estate sale in Kokomo, Indiana. It carries a serial number within 15 of the key above which was purchased from Saint Petersburg, Florida in the U.S. carrying the S/N 3192. How these two identical keys ended up both in the U.S. and in their final locations is a mystery but I am so pleased to have them both together again after such a long time within the collection. I just wonder how their stories differ from one another, if only they could speak. This example has a paper label with a 52 over a 120 and has a red official stamp mark which is yet to be confirmed of its origin. It carries the painted anchor stamp proving its Naval provenance. Japanese Straight Marine Hand Key Type 2 circ 1942. This example, although missing its terminal thumbscrew on the centre terminal, it is complete. The nameplate is unstamped, unlike the 1st and 2nd but differs by one character at the end of the third line. Due to this fact it imposible to date it accurately as the date stamp is mssing but would be similar. It does however carry the Navy Anchor Stamp clearly visible in the bottom right hand corner of the plate. Japanese Aircraft Hand Spark Key circ 1940. This key with its large replaceable 1/4” diameter contacts and earth strap from the trunnion to the pivot bracket would have been housed in a steel enclosure. This key was used on large Japanese bombers or aircraft stations but not on fighters where radio communication was limited due to interference from electrical equipment onboard. Bakelite base measures 5 ½” x 3 ¼” with nickel plated brass fittings. Japanese Aircraft Hand Spark Key Circ pre 1940. This early example which is similar to the one above has some similar design fratures with the replaceable 1/4" contacts and spring tension assembly. What is unusual is that the main trunion screws along with the two locking side screws have a cross slot which I have not seen on these keys before. Also the terminal screw and gap adjusting screw heads also having slotted heads rather than 'T' bars. This key would also have been originally mounted in a steel case as shown by the case lid securing pillar. It is presumed that the screw head design was altered to allow ease of adjustment with it in the case. This nickel plating on this key has suffered over time with the main arm and trunion block loosing the majority of it's plating revealing the brass underneath, it has also got damage to the knob spark protector disc. This example, which is similar to the one above, has all the same design features including the replaceable 1/4" contacts and spring tension assembly. What differentiates this is that this key is a “Make” only key with only two terminals as opposed to the above “Make and Break” versions with three terminals. Evidence shows that these keys were used with the Japanese Naval 3 – 1 Transceiver. The beautiful bright nickel plated brass hardware is mounted on a slightly smaller Bakelite base than that of the “Make and Break” version measuring 5” x 2 5/8” and would also have originally been mounted in a steel case as shown by the case lid securing pillar. This example was purchased from the Vintage Radio and Communications Museum of Connecticut. U.S.A. in February 2017 and is in wonderful condition and complete. This tiny hand key would have been mounted and used in situations where space was certainly of a premium. One noted example was removed from a captured Japanese command car in which it was being used on the Philippine island of Mindanao during WWII. The key would have been enclosed in a black plastic cover and would have slid into a lead-weighted base that was screwed to a shelf on the back of the front seat of the command car. This example is missing the cover and base but does emphasise that although the Japanese made this key extremely small, the quality of workmanship wasn’t compromised, a great little key. It carries a painted mark on the side of the arms insulated sleeve just behind the knob, these marks are common on Japanese keys as can be seen on the Naval Marine Hand Key type 2. Another example including the cover and base can be seen on the wonderful website of Tom Perera W1TP www.w1tp.com. Japanese hand key “Swallow” Model HK-7 by Dentsu Seiki KK. circ 1955 – 1965. This is an early version of the HK-7 by Dentsu Seiki KK with the Swallow logo and Model number embossed in the base. There are subtle design differences between this and the slightly later one below and dates it nicely. The base is straight sided more like the Japanese marine and aircraft keys from the war period and not stepped, like Sato and Hi-Mound bases, the trunnion posts are also angled towards the top and not squared. The contacts are mounted straight to the base and not on plinths and the terminal screws are slightly smaller on the earlier version. Generally there is a natural progression in design from Japanese military keys of the 1940’s through the Dentsu Seiki keys to those of Hi-Mound in the late 1960’s and 70’s. It has the same ball bearings in the end of the trunnion giving this a very nice light feel. The nickel plated hardware is mounted on a Bakelite base and trunnion block. The base measures 5 5/16” (135mm) x 3 1/8” (80mm). Dentsu Seiki Co Ltd was the predecessor to Hi-Mound. Japanese hand key Model HK-7 by Dentsu Seiki KK. circ 1955 – 1965. A well made hand key with ball bearings in the end of the trunnion giving this a very nice light feel. The nickel plated hardware is mounted on a Bakelite base and pivot block. The base measures 5 ¼” x 3” and looks similar to the SATO hand key. Dentsu Seiki Co Ltd was the predecessor to Hi-Mound. Kenpro KK-60 Japanese Hand Key circ 1980. This is a Japanese manufactured British style heavy duty hand key. It has 1 ball bearing at each end of the trunnion giving it a lovely feel and with a wonderfully organic styled Perspex cover which follows in the path of the Hi Mound Keys. It is fully adjustable with a heavy lever, silver contacts and rear mounted pull down spring typical of the classic British design. A good looking and usable key, the KK-60 being the middle of the range of Kenpro Keys. The KK-71 was produced with adjustable rear contact, Perspex cover and mounted on a marble base but with brass hardware. Kenpro is owned by Vertex-Standard which is the company which also owns Yaesu. Hand Key No 2700 by SATO Parts Co. Ltd. of Japan. Circ 1955 – 1965. This small hand key made by SATO Parts Co Ltd. of Japan has a model number of 2700. It has a moulded Bakelite base with the SATO name and Japan on the underside and chrome plated arm, pivot frame and terminal nuts. 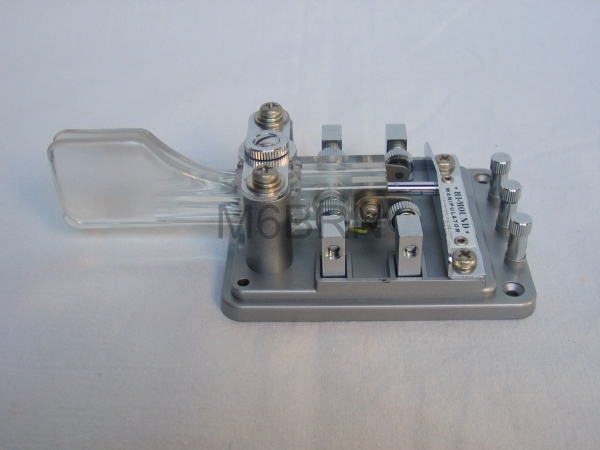 It was a well made key, manufactured for the radio amateur with centre adjusting screws for the arm and is the smaller and least expensive of the known SATO keys produced at this time, it is a close copy of American keys like Speed-X and Signal Electric being also made before and during this period. 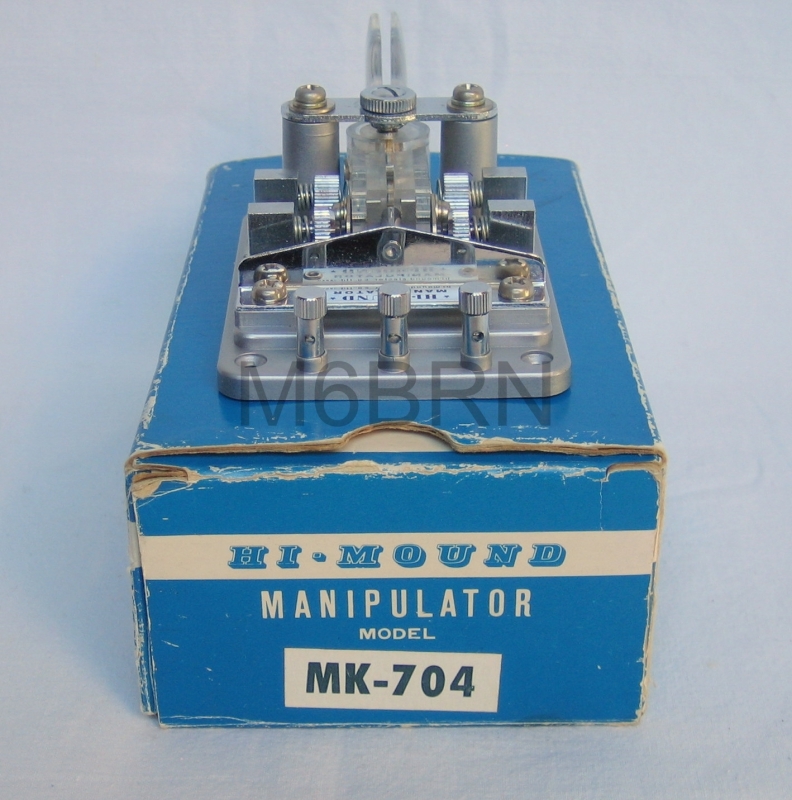 Hi - Mound MANIPULATOR Model MK-704. 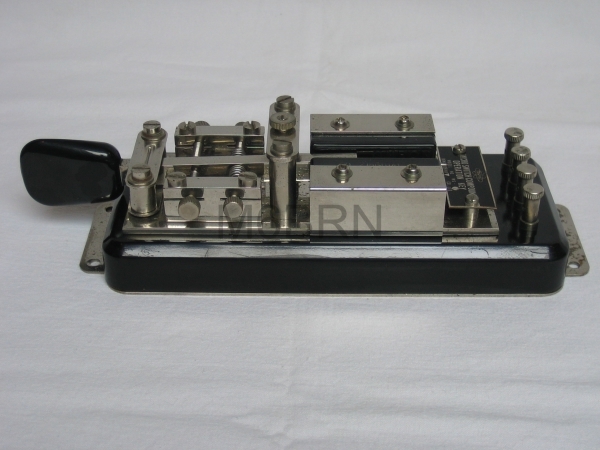 This is the Model MK-704 with twin paddles, they made 3 versions of the MK-704, one with a single black paddle, one with twin black paddles and one with twin clear paddles. This example is of version 3. They also produced a MK-704Z which was the single black paddle version 1 mounted on a marble base and with a clear laminate cover. Hi-Mound has been in business since just after World War II, and these well-made keys, paddles, and bugs have a well-deserved reputation for quality. "High Mound" is the closest English translation of the founder and President's name-- Takatsuka. There appears to be lots of variations with the same model number, expecially the HK straight keys. Perhaps they produced them for different markets. The Americans seem to have preferred the straight keys with flat button style finger knobs while the British preferred the curved down arm with the classic “mushroom” shaped knobs. This popular coffin Bug Key was sold under many different labels including this one sold as a Midland Model 25 – 104. circ 1960. 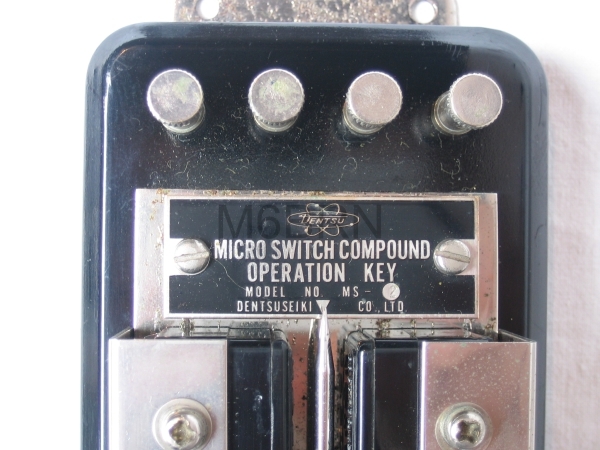 Japanese Micro Switch Compound Operation Key MS - 2. Dentsu Seiki Company Ltd circ 1953. 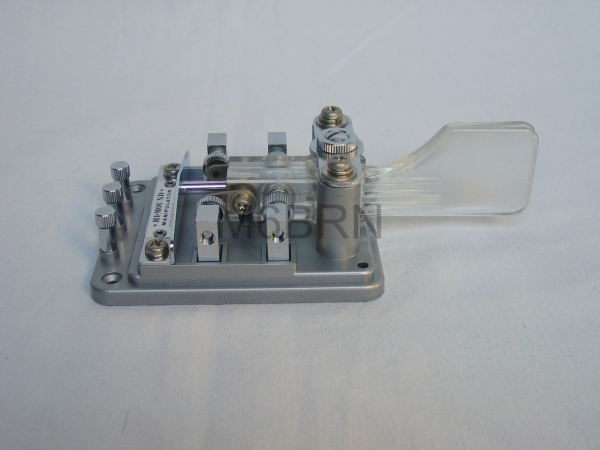 This single paddle key can be used as a sideswiper or as a single paddle key depending how the 4 terminal posts are wired. Looking at the image and working left to right, terminal 1 is the positive line feeding both switches while terminal 4 is the negative line feeding both switches. Terminal 2 is the switch line from the left hand switch and terminal 3 the switch line from the right hand switch. This example is complete, operates well and has a nice feel to it. This unusual key is quite scarce and is the first one I have come accross although I have seen examples in othe collections. Early Japanese Postal Hand Key Circ 1920 – 1935. This hand key, with its design very similar to straight British hand keys of the period, is a Japanese Key once used by the postal service. One identifying clue is the flat wire strap between the main arm and the pivot block which is shown on many Japanese military keys both Naval and Aircraft keys of WW2. It has replaceable contact blocks on both make and break positions not dissimilar to the silent contacts of German keys. It is mounted on a solid timber base which gives it good weight and where, on the front edge, the manufacturers label first was, but sadly is missing on this example. Hayakawa Electric Model 1100 Hand Key. Circ 1933. This is an example of a Japanese hand key manufactured by Hayakawa Electric in 1933. Other examples of this key can be seen with markings on the left hand side of the arm behind the knob. The symbol of a Fist around a "T" which represented the first name of its founder Tokuji Hayakawa and the number 1100 which was the model number. Tokuji later changed the Company Name to what we still know today as Sharp. It has Nickel plated hardware on a Vulcanite base, this then is mounted on a secondary wooden base. It is recognisable by the spring looking copper strap mounted on the right hand side between the arm and the trunnion block. Many Japanese keys, around this period, can be identified by these straps. This example however has no manufacturer’s marks and could indicate an early example. Tokuji Hayakawa was born in Tokyo in 1893 and due to difficult domestic circumstances he was adopted by the Ideno family. It was not until he grew up, however, that he learned of this. He left primary school after second grade due to his family’s poverty, and was apprenticed to a maker of metallic ornaments, he worked diligently there to improve both his skill in metalwork and understanding of the trade, earning the trust of his master. Though the buckle had been used since ancient times for such accessories as armour and shoes, it started to be used on belts for boys’ trousers in the 15th century and came to be used in women’s clothes in the 19th century, it took two forms: practical and decorated. When Hayakawa launched his buckle in 1912, demand in Japan for the buckle increased with the spread of Western-style fashions. Hayakawa and other artisans, however, had not yet had a chance to wear Western-style clothes and belts. In 1913, Hayakawa acquired the patent of an innovative water faucet, and in 1915, he developed the prototype of the sharp automatic pencil still sold today. Afterwards he demonstrated managerial genius, expanding his enterprise into electronics manufacturing of world-famous radios, tape-recorders and televisions, he was active in social welfare programs. He died in 1980 at the age of 86.